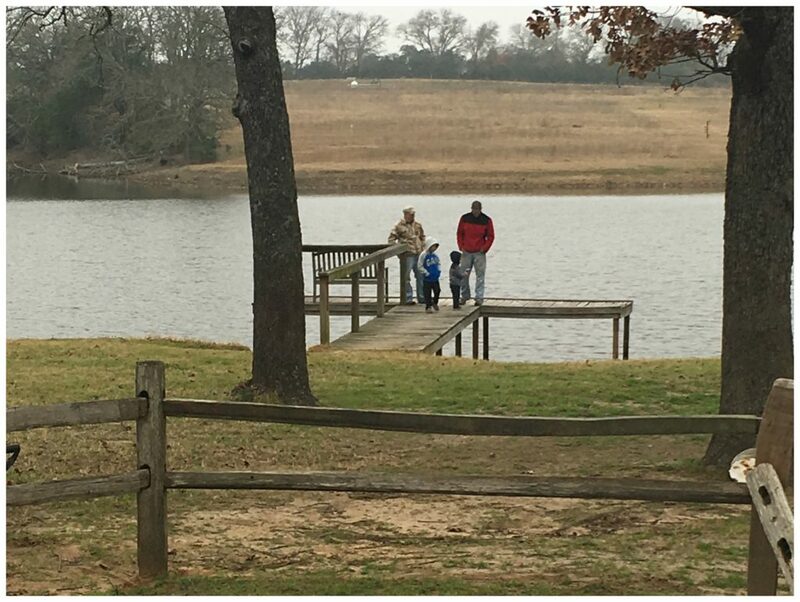 We ended up taking a spontaneous trip to the ranch last weekend. On Thursday afternoon, Chris looked at me and said “It’s a 3 day weekend. 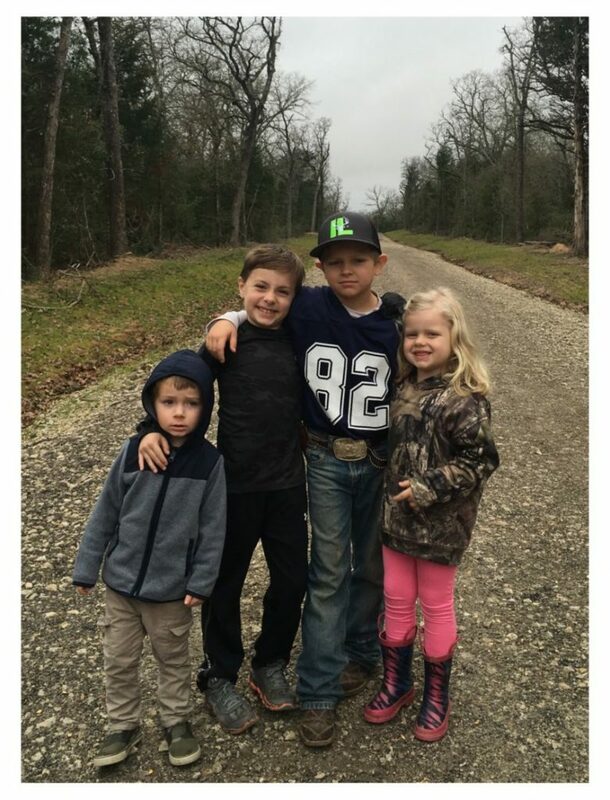 Why aren’t we going to the ranch?” I couldn’t give an answer, so we packed up our stuff and called my sister’s family and told them to join us! The weather was kind of yuck, but we had a blast! Yep, the ranch is always a favorite. Lots and lots of cows. 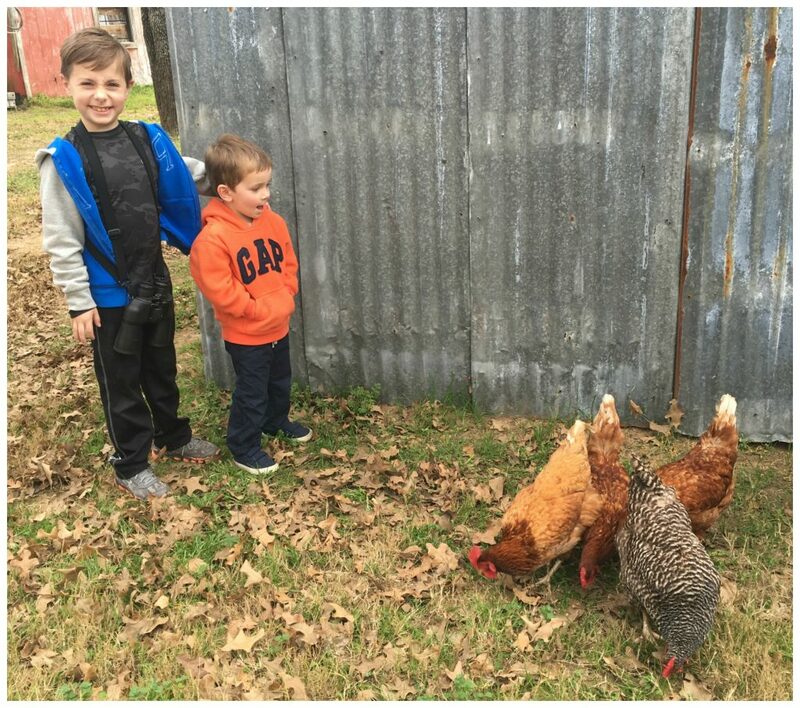 We went to see the chickens at Big Daddy’s and Sue Sue’s. Brody was a fan. A little bit of fishing. The boys were so cute cuddled up together at the end of the day. Even with the 5 years difference between them, they play so well together. 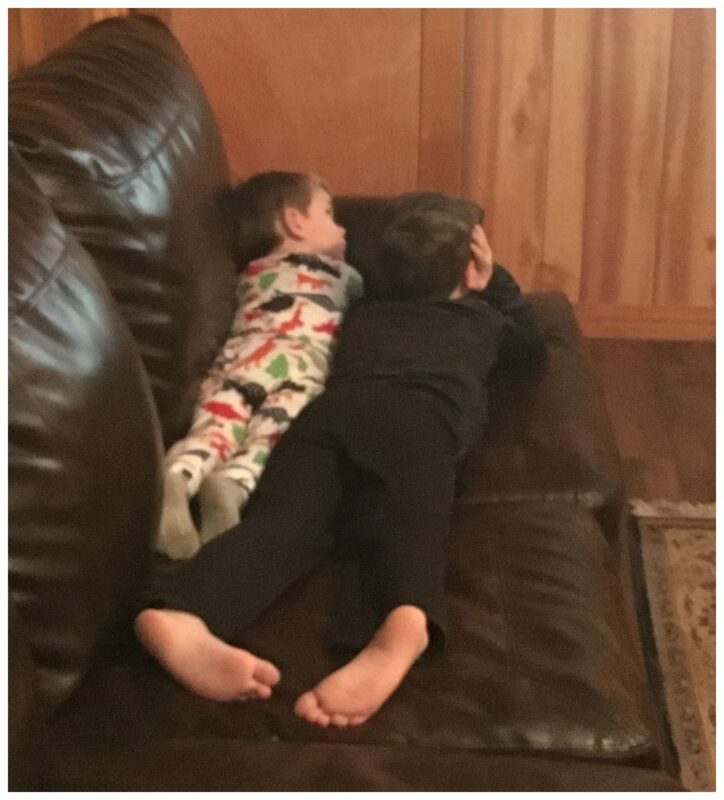 I pray that they are as close as brothers! I forgot to tell y’all about a Christmas gift I received that is now a favorite of mine. I had one of these while in college, but haven’t had one since. I saw the towel wraps in the Pottery Barn teen catalog and asked for one for Christmas from my parents. And ya’ll. I love it just as much as I remembered. I put it on just after drying off after a shower, and I wear it while drying my hair and putting on my make-up. Why in the world did I go without one for so many years? Click HERE for the wrap. As promised last week, I’m going to be giving y’all Get Healthy tips and tricks every Friday. Today, I’m sharing some more favorite foods. 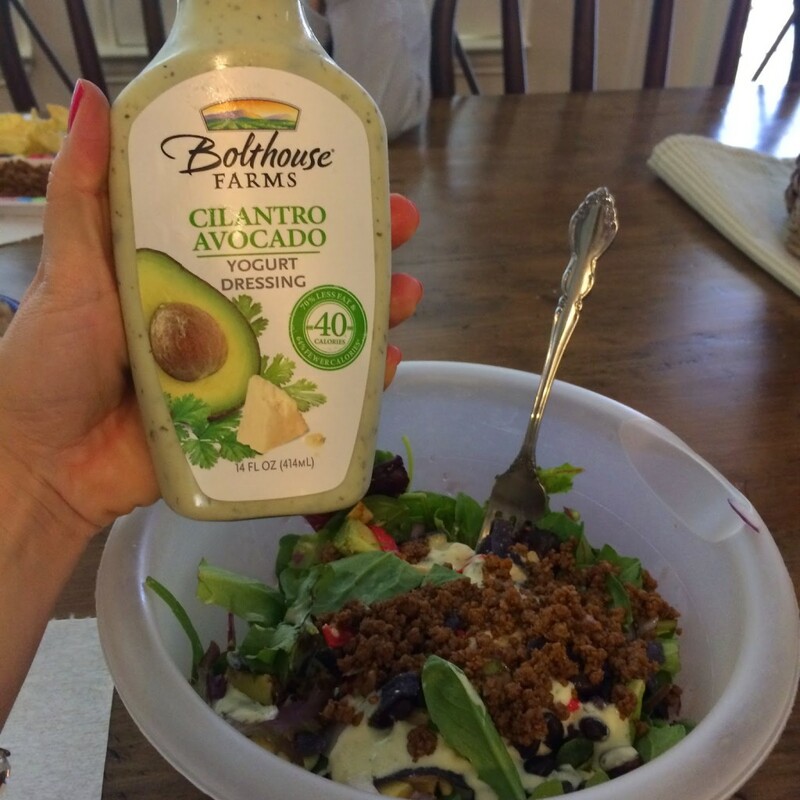 I’ve been bringing back a couple of old favorites, like this Bolthouse dressing that I LOVE! It’s perfect for taco salads!!!! I also started cooking butternut squash in the microwave again. 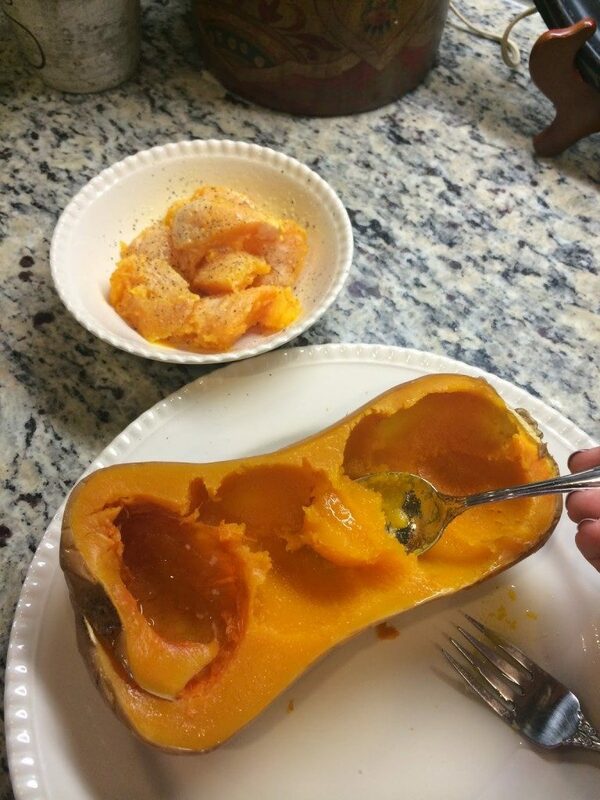 I cut the squash in half, scoop out the insides, and lay it down on a plate (flesh side down) in just a little bit of water. After popping it in the microwave for about 10-15 minutes, it’s easy to scoop out and quite delicious. I like it with salt, pepper, and a little bit of parmesan cheese. 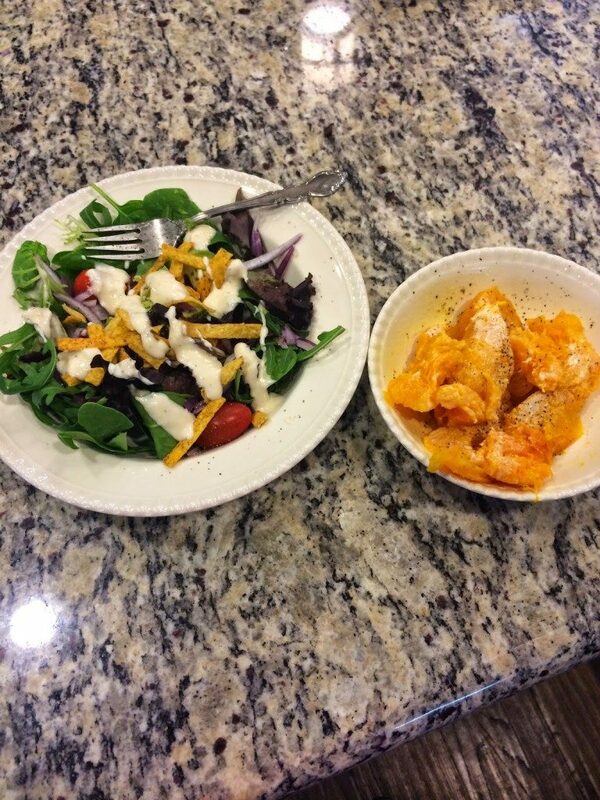 A couple of days for lunch I had a bowl of the butternut squash with a side salad. Oh, and I after I went ON AND ON about my new Zella high waisted leggings last week, I picked up another pair. No pic of me in them yet, but look how cute they are. 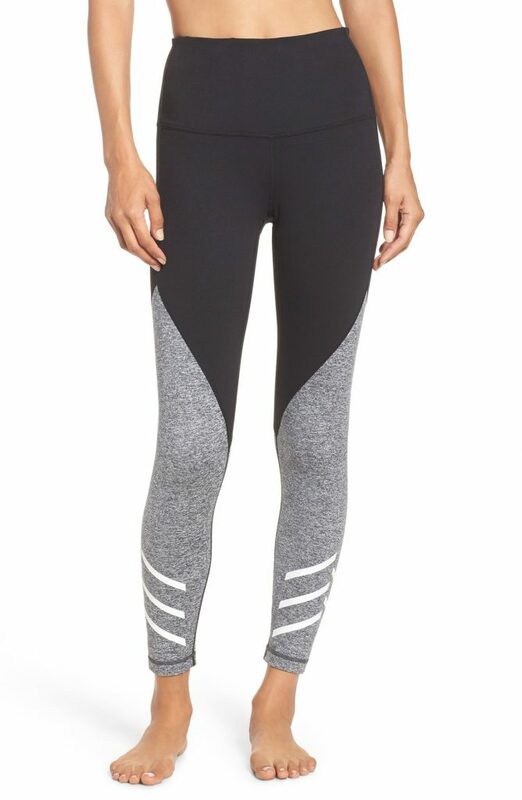 Click HERE for these arrow high waisted leggings. At 5’4″, these are the perfect ankle length on me, and I love the design. These are a great option for those of you that don’t want plain black, but you aren’t in to the crazy patterns. I also bought THIS sports bra. I’m hoping the 106 5 Star Reviews are all right! Social media peeps got a sneak peek of this ruffle hem top earlier this week (because I just couldn’t wait to share it). The top is DARLING (comes in black and red as well), and I’m wearing it with my new jeans from Old Navy that I told y’all about a couple of weeks ago! I got a 4P in the jeans, and they are perfect on my 5’4″ frame. I’m wearing a small in the top, so it’s true to size. It’s blousy, but it’s meant to be that way. I would suggest however that if you don’t have a large chest, you should for sure size down. Also, I would suggest a cami with this cream color (but I doubt the other colors would need it). And here’s a close up of the jeans. 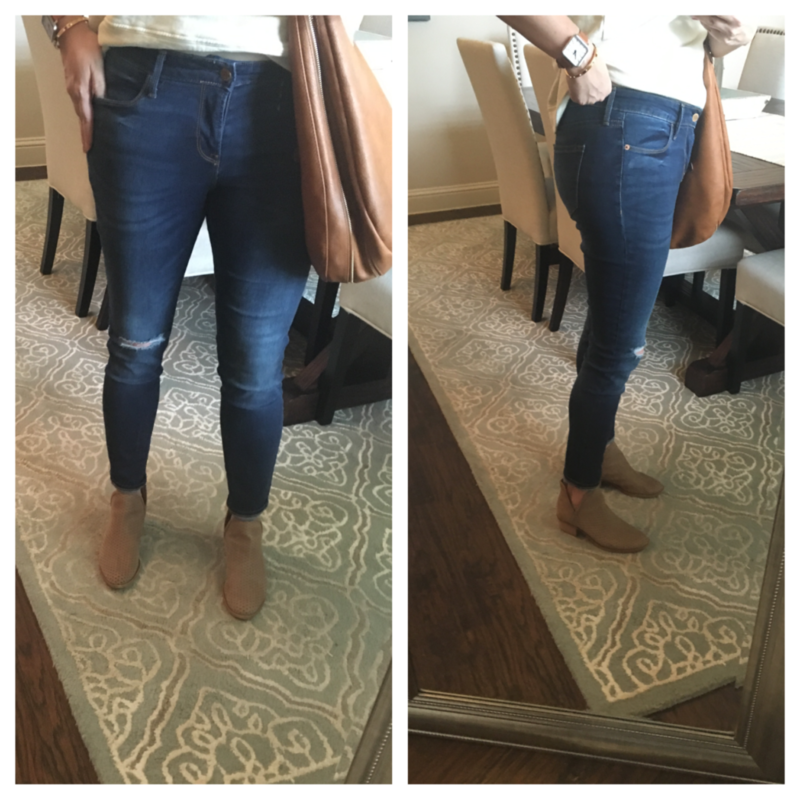 I’d been hearing a lot about how awesome the Old Navy mid rise rockstar skinny jeans are, and I agree! I like them a lot, and they are certainly a great price. GIRLS! I put this cardigan on Facebook yesterday morning when I saw that it was 50% OFF….and then I tried it on in the store that afternoon….and then I brought it home to live with me. 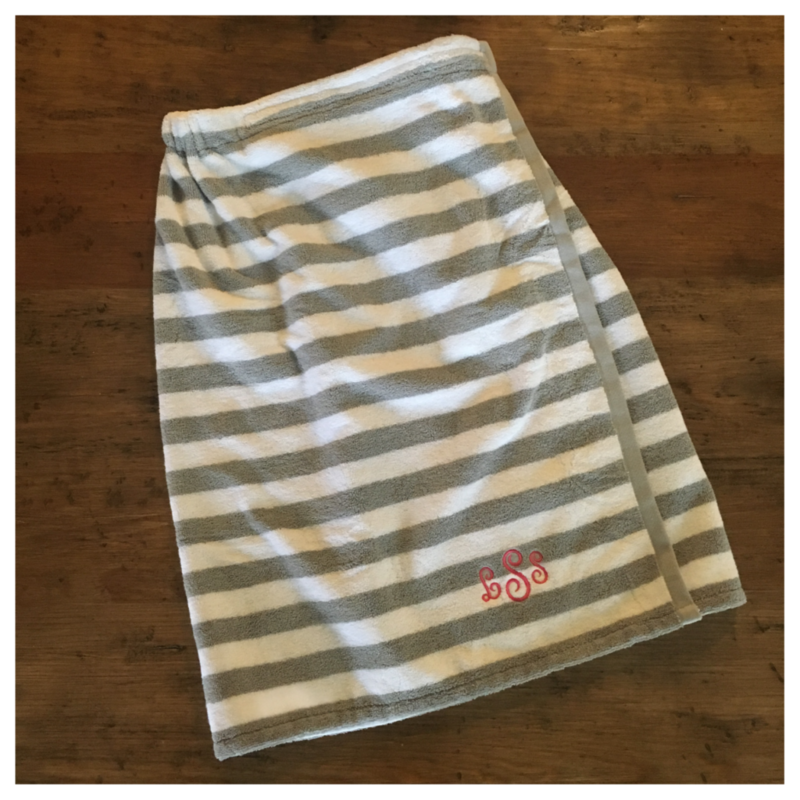 It’s soooooooooo cute and soooooooooo soft and soooooooo reasonable (now that it’s 50% OFF)!!!! It would look good over cream, light or dark grey, or black. You could wear it with a tee, blouse, or light sweater (and I’m guessing you probably already have something in your closet that would work with it). I’m wearing a small in the cardigan. I wanted to try on an x-small as well, but they didn’t have one in store…so I just went with the small. I’m absolutely loving the necklace as well. The pictures don’t do it justice, but one side is a really bright silver/gold combo, and the other side is a dark gunmetal. It will look good with tons of different outfits, and it’s 50% OFF too! It would also make a great gift for somebody! I got this sweater too, but I can’t find it online! I’m hoping I’m just overlooking it, so if you find it, please post an item #. I should have taken a picture of the back, because it’s the material of the what’s peeking out under the sweater. I threw the sweater on when I got home, after it had been crumpled up in the bag, so forgive the wrinkles. 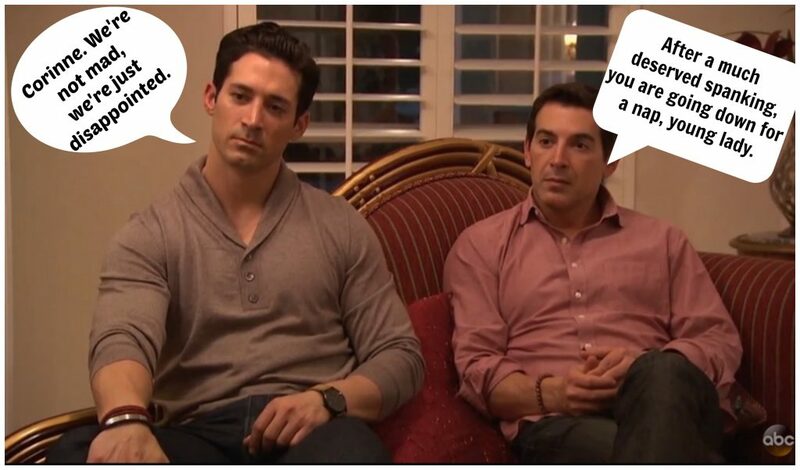 If you didn’t already see my Bachelor recap this week, click HERE to check it out. This is how I imagine JoJo’s brothers felt while watching. Okay, last thing for today. I have something I would like to put to a vote! This is the weekend that I’m going with a bunch of girlfriends to the 1 year Anniversary Party for Lowe Co (Catherine’s stationary line), and I’m going to have ya’ll vote on which outfit I should wear! I’ve got two choices for you today. This is Outfit #1! I’m leaning towards this one. Outfit #2: I really like the animal print clutch…however, I could always wear the animal print clutch with Outfit #1, and just lose the animal print bracelet. And if you are needing a strapless bra, the one I’ve recommended below (and several times in the past) is HANDS DOWN the best strapless bra I’ve ever owned. You might even wear it on days you don’t have to wear a strapless. Because it’s just that good. So what’s your favorite? Outfit #1 (lace peplum) or Outfit #2 (green off the shoulder)? Please sound off in the comments! Thanks for stopping by today, ladies. Have a wonderful weekend with your people! I like the bright blue in option 2! I hope the party is a blast! Blue lace all the way! Also, I bought that LOFT cardigan earlier this week. I work it to work yesterday and received so many compliments. And you’re right, it’s incredibly soft. Love them both but I’m going with #2. I love the blue lace! My vote is for outfit #1! I like your idea of wearing the animal print clutch with it! I have those exact Zella leggings and they are my favorite pair (and I own Zella, Athleta, and Lulu Lemon). My vote is for Outfit #1! I love the lace, the color, and of course the peplum! Both outfit choices are so cute…buuuuuut if you’re going to make me pick, I pick the first one! Adorable outfits, but I loooooove number 1!!! So cute! That Loft cardigan is so soft and too!! Love it! I’m loving both outfit choices!! The good news is you can’t go wrong! And you scored big time with those Loft goodies. So cute! My vote is for outfit #2. #1 definitely!!! Love the lace with the animal print. Have a great time! Both outfits are great but I love option 2! Outfit #1 for sure!! Love the lace top! I’d go with outfit #2. For a fun girls night, I think the top in #1 is too conservative. Outfit #1! And I like it with the clutch you have paired – it’s perfect for a girls night out. I pick Outfit #1. I think the lace and the peplum take it over the top! Excited to see pictures from the night! Sheaffer- you will look cute in either outfit but I do like the first one a tiny bit better! Also wanted to comment on the Old Navy jeans- I stumbled into them after trying the Wit and Wisdoms this summer during the Anniversary Sale. I am almost 5’9 so the Wit and Wisdoms weren’t long enough, but Old Navy has the Tall option online (and sometimes in stores). The Regulars are great if I want an ankle length and the Talls are perfect with flats. Just thought I would share! Thanks so much for the blog- love it! I really like #2 … I love the off shoulder look! Love the salad dressing Rec! Where do you get it, please? I’m in Dallas, but haven’t seen that brand. I’m taking a Mexican themed salad to a dinner tonight and would love to skip homemade dressing. I like outfit 2. I think the off the shoulder kicks it up a notch. Whatever you choose, you will look fabulous!! Have fun!!! I vote for outfit #2. I love outfit #1! But you really cannot go wrong with either ! Have fun ! My vote is for #1 (I’ve been wondering if I should get the earrings!). But they are both so cute so I know you’ll look adorable in either!! I love the top in #2 so that’s my vote… #2! I really like the off-the-shoulder for a fun night out, so I would say option 2, but you know how they look on and how you feel in them–so go with what makes you feel good! Definitely outfit #1 just as shown. Have fun! Lace top! I have high priced jeans and I love my Rockstars equally! #1 is definitely my favorite! Thinking about that cardigan and that necklace from Loft! Both are cute! But I love outfit #1. Super classy and FUN! Like both of them, but love the pop of color in #2. Have a fun weekend! Outfit #1! OOh that sports bra is in my cart now, I need a new one and those reviews drew me in! have a great weekend! #1 without a doubt! The second blouse is ok, but not as special as that awesome blue lace one! 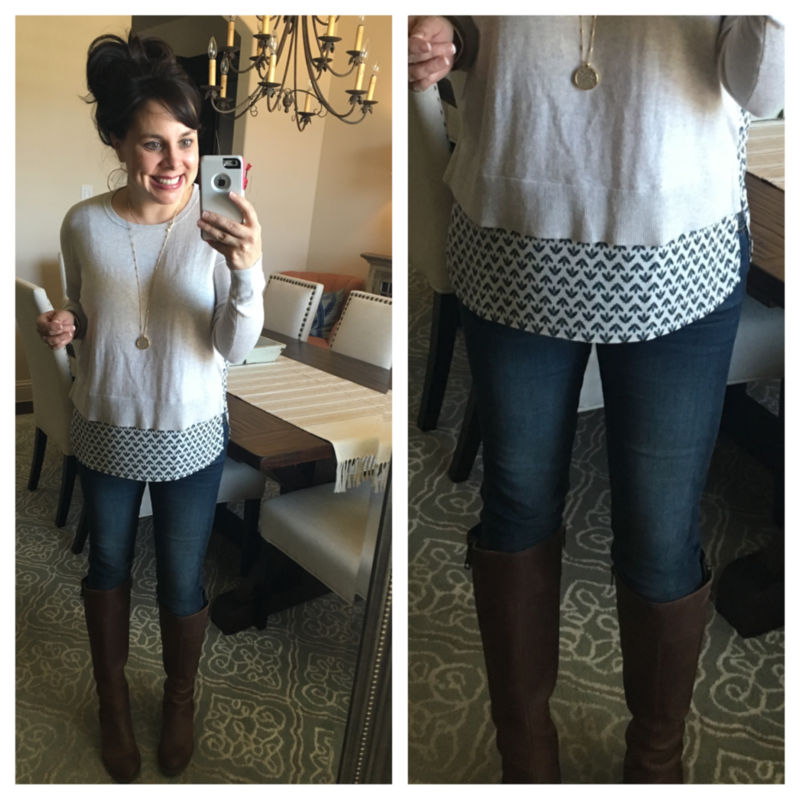 I like the lace top in #1 – and those black coated skinnies are so fun! 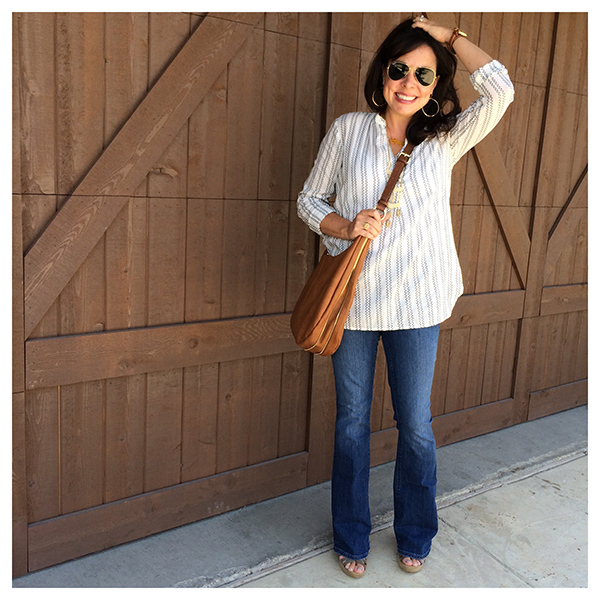 I love outfit #2… And I want to purchase that off the shoulder top from anthro!!! What size did you order? Thanks!!! Both of those outfits are really cute! Either one will be beautiful on you for the party. After you said how incredibly soft that cardigan is on FB yesterday I had to pop over and buy it. It looks adorable on you, too! Can’t wait until it arrives! We’ve had non stop rain for a couple weeks so cute, cozy and comfy is what I’m wanting. I vote for #1! So cute! Love the lace in outfit #1. But let’s face it, you’d look fabulous in either!!!! Turquoise is my favorite color, so I have to go with option #2!! 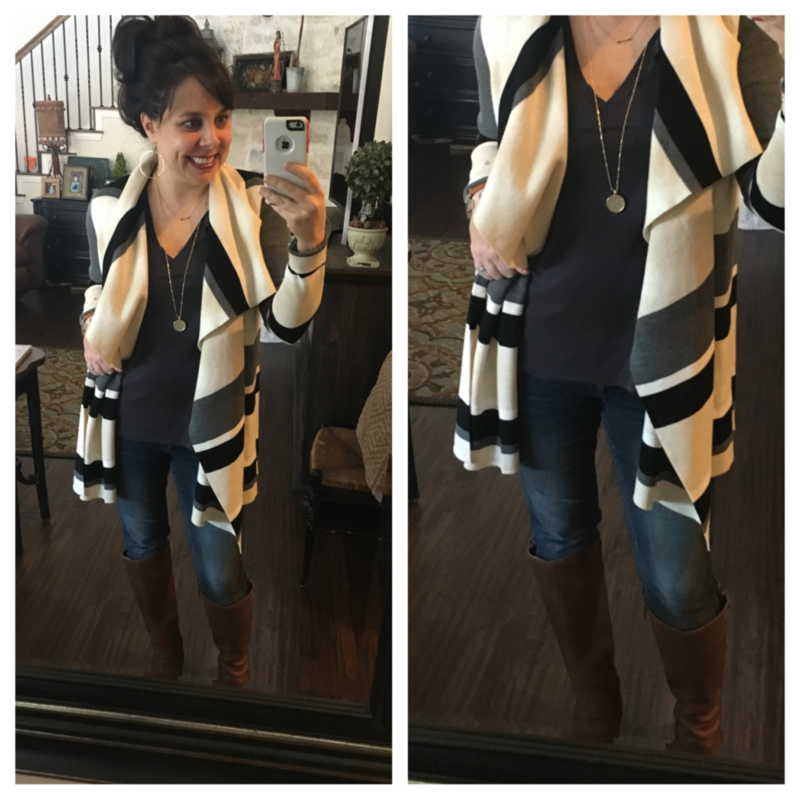 Outfit #2 – all the way! The dressing looks great – will have to search for it here in CA. Go for outfit #2 – different colors w/animal print – way to go! Outfit number 1 and have fun! #1!!! Love anything peplum and that is such a gorgeous color! Not to mention it’s in lace!!! Outfit #1 (blue lace) with the animal print handbag! Awesome! 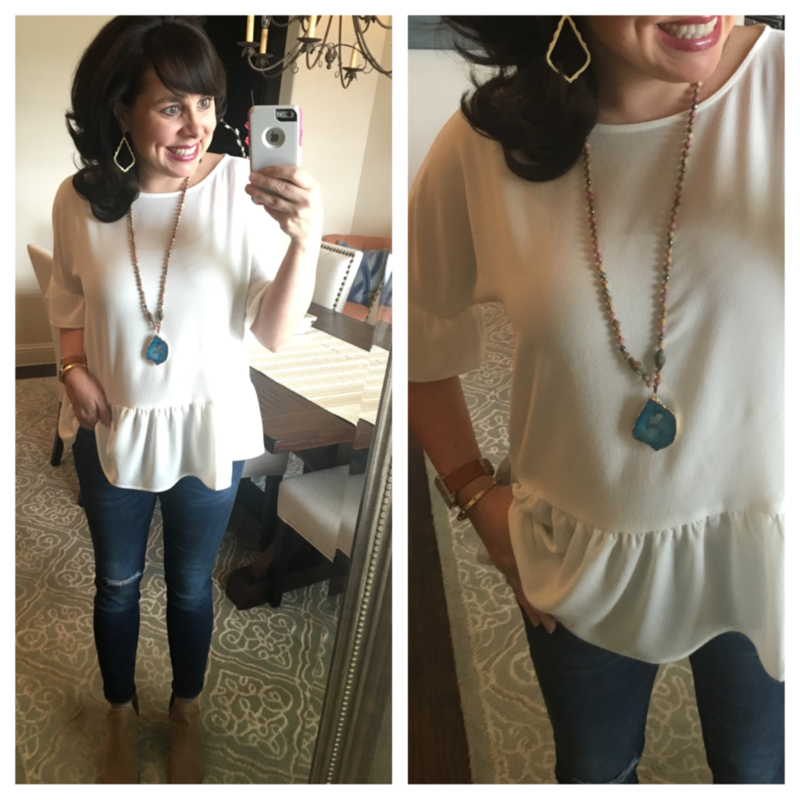 And I just ordered the Loft necklace…. love it! Thank you! I love lace and am a sucker for anything close to navy blue so no brainer???? That salad dressing sounds so food. I am going to have to try and find it. I also am going to have to try butternut squash in the microwave. I am so impatient to bake it in the oven. You look so good in all of your outfits, love your style! And I’m gonna go with numero uno, stopping by from Friday Favorites. Enjoy your brunch! I’m looking for a new iPhone case. What kind is yours? Thanks!! Sometimes I think kids would be a lot happier without the internet! I vote for outfit 2…I love the clutch and bright color of the top! You always find the cutest outfits, but I’m a sucker for lace tops so my vote is for #1. The blue top you show looks a different blue than the one shown online at Nordstrom. Are they the same and maybe the lighting is different in your picture? Just wondering what the true color is. Thanks, Sheaffer. Can’t wait to see what outfit you chose to wear this weekend! Scheaffer! I am a regular reader, but not a regular comment-er. I so enjoy your blog, fashion, fun, family, etc. I am from MN… so I would love a better understanding of the ranch. Is it shared family property that has been in your family for generations? Is it you and your husband’s vacation property? (Here in MN everyone has lake cabins.) Are Big Daddy and Sue Sue your aunt/uncle, your husband’s parents? 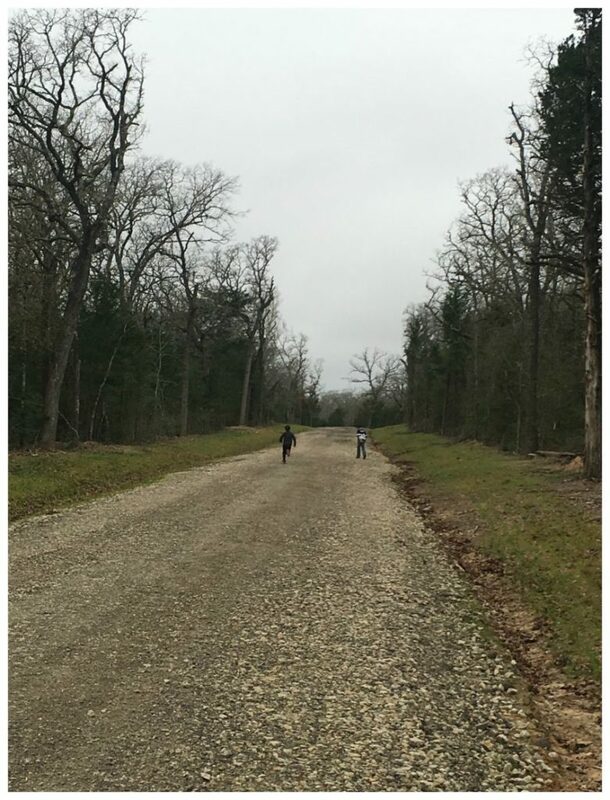 and is their property adjacent, or it is another home on the same ranch? Are the cows on the actual ranch property and do they belong to Big Daddy? I know… sooo many odd questions. I am sure you have explained in the year’s prior to my finding you, but I would enjoy learning more! (or maybe if I were from Texas I wouldn’t need any explanation and I would just ‘get it’! Nope! I get it! 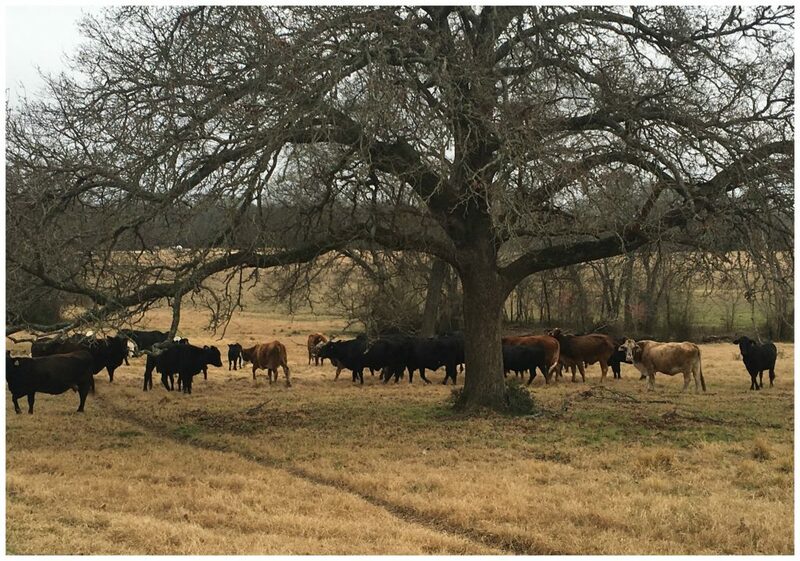 I am from a family farm (though not cattle), so I understand how times change, but of the value, heritage, and connection to the land lives on. What a wonderful legacy. Thank you for sharing! You blog is one of my “regulars” I visit multiple times a week.